Washington D.C, April 14: The world's largest airplane took off for the first time on Saturday morning. The aircraft, built by rocket launch company 'Stratolaunch', had its critical first test flight and is designed to launch rockets into orbits from the air. According to The Verge, the world's largest plane weighs 500,000 pounds with 385-foot wingspan was lifted off from Mojave Air and Space Port in Mojave, California. The inaugural flight was for 150 minutes and later the plane was made to do a smooth landing. 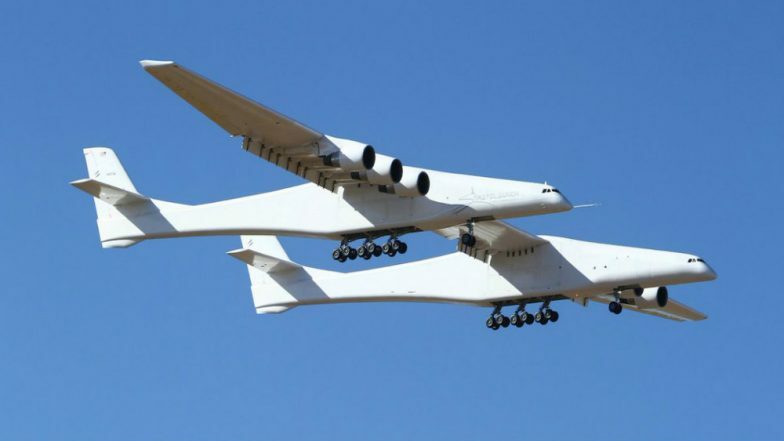 The dual-fuselage Stratolaunch is designed to fly at an altitude of 35,000 feet, where it can drop rockets that ignite their engines and boost themselves into orbit around the planet. There is no rocket on this particular flight. But now Stratolaunch has already signed at least one customer, Northrop Grumman, which plans to use the company's innovation to send its Pegasus XL rocket into space. "It was an emotional moment for me, personally, to watch this majestic bird take flight," said Stratolaunch CEO Jean Floyd. The aircraft performed as expected, reaching a maximum speed of 175 miles per hour and a peak altitude of 15,000 feet. "The flight itself was smooth, which is exactly what you want a first flight to be," said test pilot Evan Thomas. During the first phase of the flight, Stratolaunch tested the airplane's handling qualities. "It flew very much as we had simulated and as we predicted," he said. According to Stratolaunch, the plane's systems "ran like a watch" and that the aircraft landed "on the mark" after a few low passes.